136 pages | 6 B/W Illus. This book offers a comprehensive analysis of central banks, and aims to demystify them for the general public, which is the only way to have a rational debate about them and ultimately to make them truly accountable. The book originates from the author’s graduate lectures on Central Banking at the University of Frankfurt J.W. Goethe. It contains an overview of all the key questions surrounding central banks and their role in the economy. It leads the reader from the more established concepts (including monetary theory and historical experience), necessary to have a good grasp of modern central banking, to the more open and problematic questions, which are being debated within academic and financial market circles. This structure enables readers without specific knowledge of central banks or monetary economics to understand the current challenges. The book has three defining characteristics, which set it apart from competing titles: first, it is pitched at the general public and uses simple and entertaining language. Second, it is rooted in, and makes frequent reference to, recent academic research, based on content for a graduate level course. Third, the author thinks 'out of the box' in order to describe the possible evolution of central banks (including the prospect of their disappearance), and not only the status quo. "Stracca’s book on central banking will be a boon both to students and to those wanting a clearly written, non-technical introduction to the world of central banking. It covers a lot of ground and describes lucidly what central banks are all about. Explanation without mystique or abstruse technicalities." — Professor Charles Goodhart, Financial Markets Group, London School of Economics. "The Economics of Central Banking provides a concise and clear overview of why central banks exist, how they operate, and what challenges they currently face. The transparent presentation of the key points makes central banking – an often arcane looking field – readily accessible to a broad audience, and offers a sound starting point for readers interested in deepening the topic. A must read." — Cedric Tille, Professor of Economics, Program Director, Bilateral Assistance and Capacity Building for Central Banks, Graduate Institute of International and Development Studies. Chapter 1. money and central banks; Chapter 2. how monetary policy works: the mainstream model; Chapter 3. three questions on the mainstream model; Chapter 4. the zero lower bound problem; Chapter 5 – financial stability and the lender of last resort function of central banks; Chapter 6: will paper currency disappear and will this be a problem? ; Chapter 7. will we ever have a global central bank? ; Chapter 8. will central banks disappear? 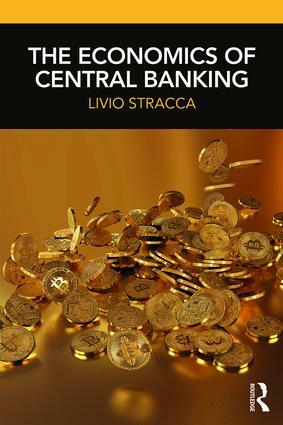 Livio Stracca is the Head of International Policy Analysis at the European Central Bank and Adjunct Professor at the University of Frankfurt J.W. Goethe, Germany. The views expressed belong to the author and are not necessarily shared by the European Central Bank.